I was down in Cabo San Lucas Mexico a few weeks ago and I had this dish at one of my favorite restaurants in all of the world for Sushi. If you want the worlds best sushi go to Nik Sans in Cabo, it will blow your mind. That being said, we told them to bring the best five dishes and one of the great dishes they brought was gorgonzola shrimp on this rice paper. The next day I was floating around fishing (we caught 22 yellow tail tuna) and all I could think about was the Gorgonzola Shrimp dish. I had to figure it out. The first meal I made when I got home I put it together on pasta and it turned out great. It is pretty simple. Take heavy cream and bring to boil and reduce to simmer in a pan until it is reduced by half. Remove from heat and add parmesan and Oregon blue cheese, parmesan, salt and pepper and nutmeg. Taste it, does it need more salt and pepper? Add some. 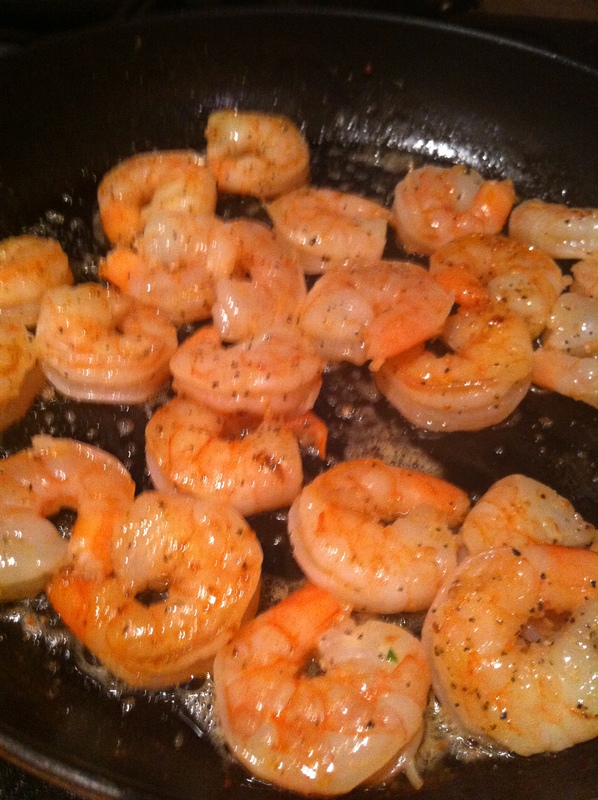 Take your medium deveined shrimp and add to a hot skillet with 2 tablespoon of butter and 2 tablespoon of olive oil, dash of salt and pepper and cayenne while searing shrimp. Cook your pasta. I use the freshest pasta available so it only takes 3-5 minutes. 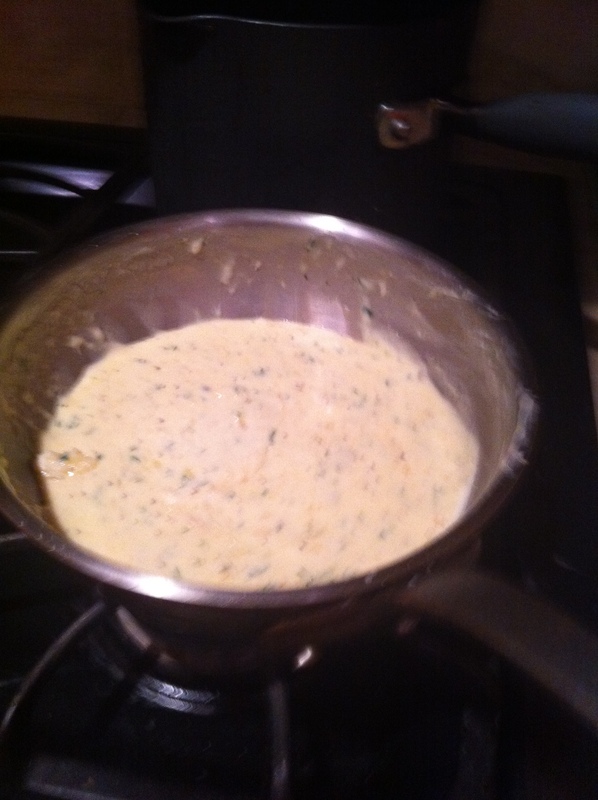 When the shrimp is done remove from heat and put in bowl, add the gorgonzola sauce a little at a time and mix in shrimp. The key is to get a good amount on the shrimp themselves without putting too much sauce in the pasta. You do not want to drown the noodles. You can always add the sauce later to your liking. This one is a winner winner shrimp dinner. 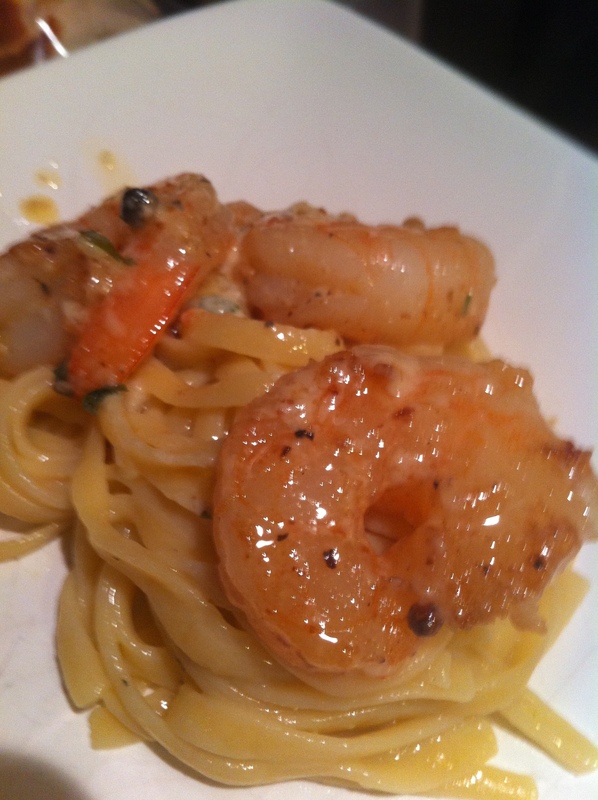 I plate the pasta, add the shrimp with the sauce on it, then add a tablespoon of sauce over the top. You can always put more of the sauce on the side if you want too. The sauce you have left over, put in the fridge and use it again. I guarantee it will not go to waste. You can use it for a thousand things.